Set between the villages of Dormansland and Lingfield, Claridge House is the perfect Bed & Breakfast retreat for visitors. Come and enjoy a short or long stay in our beautifully accommodation on the doorstep of the Surrey Hills, an area of outstanding natural beauty. Despite the tranquil rural setting, you are surprisingly close to both the M23 (J10) and M25 (J6) motorways and just 20 minutes from Gatwick Airport. Lingfield station is five a minute drive, giving direct access to London Victoria and connections to London Bridge, St. Pancras International and Thameslink services. This makes Claridge House ideally placed for both the leisure and business traveller. 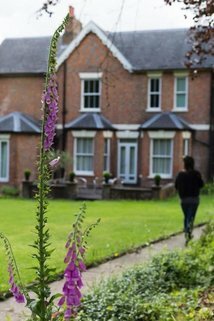 Our unique Quaker establishment offers comfortable and welcoming accommodation within a peaceful environment, making it the perfect place to unwind, relax and restore. In keeping with our ethos we are an exclusively vegetarian establishment and use organic, Fairtrade, and free range produce where possible. Click here to visit Our Food page to find out how we can accommodate your needs. Note: No TV on site, but free Wifi connection for all guests. 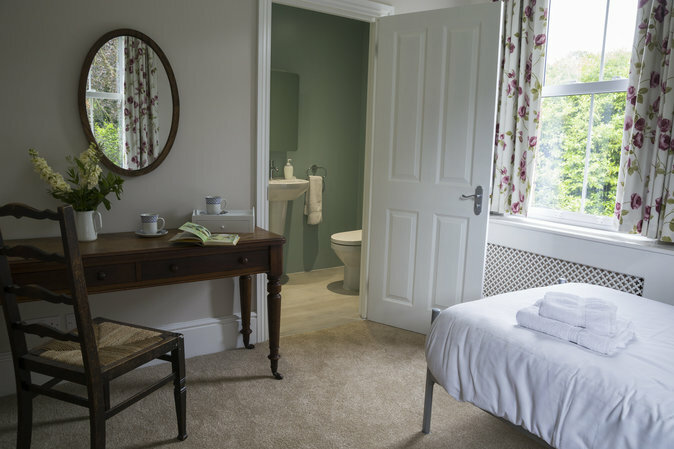 All of our rooms are individual in style and furnishing, with singles, twins and doubles available. Most have a contemporary en-suite bathroom. Guest facilities include on-site parking, free Wi-Fi and tea and coffee making facilities. In keeping with our approach to rest and retreat we do not provide televisions, nor do we serve alcohol on our premises. 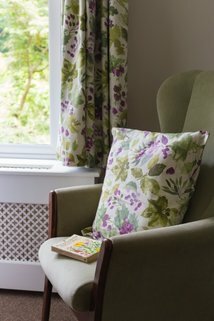 Guests are welcome to make use of our three reception rooms; relax in our quiet room, with its comprehensive library, our music room with a range of books and games, the main room, with garden views and a piano. Also enjoy access to our two acres of idyllic grounds. A vegetarian buffet style continental breakfast is served in the dining room. For alternative dining options, there are a selection of good pubs, restaurants and cafes within a short distance, offering a wide range of cuisine to suite different tastes and budgets. *Please note that Claridge House operates a strict no smoking policy in all areas of the property and its grounds. We are unable to accommodate children.